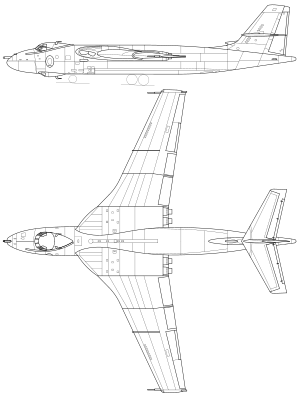 Vickers-Armstrongs Valiant je bil britanski štirimotorni strateški bombnik iz zgodnjih 1950-ih. Valiant je bil en od treh jedrskih V-bombnikov, ostala dva Handley Page Victor in Avro Vulcan sta se pojavila kasneje. Sta pa bila Victor in Vulcan precej bolj napredna. Valiant se je uporabljal tudi kot leteči tanker in izvidniško letalo. Podatki iz Vickers Aircraft since 1908;Andrews and Morgan 1988, p. 450. Andrews, C.F. The Vickers Valiant (Aircraft in profile no. 66). Leatherhead, Surrey, UK: Profile Publications Ltd., 1965. Andrews, C.F. and Eric B. Morgan. Vickers Aircraft since 1908. London: Putnam, 1988. ISBN 978-0851778150 . Barfield, Norman. 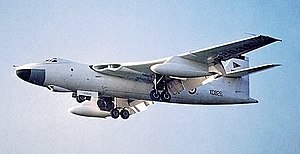 "Vickers Valiant: Precient programme management par excellence". Air International, Vol. 43, No. 3, September 1992, pp. 153–161. ISSN 0306-5634. Brookes, Andrew. Force V: The History of Britain's Airborne Deterrent. London: Jane's Publishing Company Ltd., 1982. ISBN 0-7106-0238-3. Downey, Bob. V Bombers (Warbirds Illustrated No. 35). London: Arms and Armour Press, 1985. ISBN 0-85368-740-4. Gunston, Bill. Bombers of the West. London: Ian Allan Ltd., 1973, pp 38–53. ISBN 0-7110-0456-0. Halley, James. Royal Air Force Aircraft WA100 to WZ999. Tonbridge, Kent, UK: Air-Britain (Historians) Limited, 2003, First edition 2001. ISBN 0-85130-321-8. Halley, James J. The Squadrons of the Royal Air Force. Tonbridge, Kent, UK: Air-Britain (Historians) Ltd, 1980. ISBN 0-85130-083-9. Jones, Barry. V-Bombers: Valiant, Vulcan and Victor. Ramsbury, Malborough, UK: The Crowood Press, Paperback edition, 2007. ISBN 978-1-86126-945-4. Rosemeyer, Maurice Patrick. Adventure in the Air: Memoirs of a Flight Test Engineer. London, Ontario, Canada: Insomniac Press, 2009. ISBN 1-926582-14-4. Čas zadnje spremembe strani: 20:05, 12. december 2017.